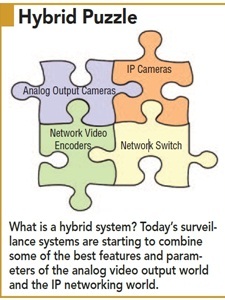 What is a hybrid system? Today’s surveillance systems are starting to combine some of the best features and parameters of the analog video output world and the IP networking world. Many dealers and installers are now required to perform upgrades while incorporating existing system technologies. And there are many dealers that maintain analog video systems. These facts make it very important they understand how both system types function. Some basic knowledge of simple electronic theory, networking and test equipment will be helpful during these series of articles. However, the learning curve will be served up as painlessly as possible so even those who have little or no knowledge of electronic theory should comprehend it all just fine. In order to be able to troubleshoot any security system, one must first understand the proper methods, materials and procedures required to install a system. And so that is where we will jump in with this first installment. The following characteristic troubleshooting areas apply for both analog and IP surveillance technologies. To start, a few basic statistics on the problems found in system installations. It is a fact that 65% of most installation and troubleshooting problems are associated with the type of interconnecting cabling, connectors and connections, and installation methods. The next area, which makes up approximately 27%, is related to insufficient input power to camera equipment, line surges and excessive temperature operating environment of the equipment. A technician will have to know and gather information about the system in order to troubleshoot the problem and service the equipment. In order to gather this information — ask questions! Troubleshooting any system is an art form; asking the right questions and in the proper sequence can eliminate many hours of frustration and incorrect system diagnostics. Whether the system is analog, IP or a hybrid, the general starting questions are the same. Many of the questions highlighted in this article, particularly the first few, may seem very basic. However, they are the perfect starting point for proper troubleshooting of any system. One of the first steps in troubleshooting a system is examining the system block diagram. Doing so will allow the service technician to obtain an understanding of the equipment layout. This step is especially important when systems include different camera technologies and monitoring locations. Following the video and data paths of an entire system is essential for troubleshooting procedures. Understanding these paths will help determine, for instance, the proper terminations of all signals. Remember, it is much easier to understand a system on paper than to understand that same system in the field. Examining the diagram or system layout also takes less time than walking through the system in the field. As you take on the troubleshooting task and work through the questions laid out here, remember the axiom: Electronics, for the most part, are logical in design while human behavior is not. Has anyone tried to correct the problem before now? Has any new equipment been installed? Have any building changes taken place such as electrical work, new added equipment or removal of equipment? The responses to these questions are usually the most difficult to interpret. If any of the answers are no, it could be a red flag that signifies an incorrect or inaccurate response. The reason is typically due to a lack of knowledge regarding changes or people not wanting to take responsibility for the situation. If a previous technician or installer has shorted a terminal with a screwdriver, adjusted the controls without knowing the functions, did not know proper cable installation procedures or changed an IP address it can add to your headaches. So it is a good idea to ensure no one else has tried to fix the problem. If you find someone has, you should perform a complete check of all connections and settings before moving forward. It may also be a good idea to speak with the previous technician regarding the problem, but proceed with caution. One person’s impression of the system’s trouble may or may not be accurate. System technicians must rely on the information at hand, but they must also verify it. Assumptions have led to excessive troubleshooting time, and many failed attempts at system repair. If the answer to any of the questions is yes, then usually conducting a factory default of all associated equipment is your first choice of action. However, remember if the equipment offers no backup storage method, once the factory default is enabled a complete manual programming sequence of all equipment may be required. This could be time consuming depending upon the complexity of the system. Since, as mentioned, approximately 65% of troubleshooting problems are cable-related this should be your next area of concern. What type of cable was installed? When was the cable installed? Who installed or pulled the cable? System interconnecting cabling is the lifeline for any hybrid surveillance system. Whether it is standard video coaxial cable, shielded twisted pairs for data, Category-5e/6 for unshielded twisted pair (UTP) equipment or Cat-5e/6 for networking, all industry recommendations should be followed to ensure proper operation. So let’s take a closer look at what to be concerned about and look for depending on the transmission medium deployed. Let us start with coaxial cable, which has been associated with computing, networking and hybrid systems for many years. While the use of coax has declined, for existing systems built on coax cable backbones that have expanded through the addition of IP equipment or those with longer distance requirements, the use of this tried-and-true wiring remains a popular choice. The types of coaxial cable are referred to by an RG-number or name; however, there are major differences in the construction of each cable called by the same number. The type of material in their composition is critical and can affect a system’s performance. In video surveillance systems, the signal that is transmitted by the analog output camera equipment is known as a baseband or composite. There are significant differences between baseband/composite type and RF (radio frequency) video cable. Baseband/composite’s signal consists of video information, color information, and vertical and horizontal synchronizing signals. While RF has all the same information found in a baseband signal, there is one exception: all of its information is protected by a radio frequency shield. This RF shield safeguards the actual video information from outside elements and provides a different means to distribute the signal. It is these characteristics that require different materials be used in the cable construction. Baseband/composite video cable requires a center conductor made of copper (solid or stranded), a 75-ohm impedance characteristic and an overall outer shield construction made of copper. In an RF video cable, the center conductor is made of copper-covered steel, and although the overall impedance is also 75 ohms, the shielding of the cable is aluminum or foil rather than copper. This variance causes much confusion and problems in the security industry, such as distortion of the video signal and an excessive loss of signal strength. Consider this example situation: A hybrid system incorporates an analog output camera for a parking lot application in which the distance from the camera to the first network closet exceeds the normal rules in networking (listed as 100 meters) and, therefore, coaxial cable is installed. The system then converts the composite video into a signal to comply with networking standards. Upon start-up, no video is able to be viewed by that parking lot camera on the network; however, when tested at the camera site video is present. Now what? The answer can be as simple as the wrong type of coaxial cable selection. Most network encoders that convert an analog video signal into a compressed IP addressable signal usually require a signal level strength of 50 IRE units. A signal input to the encoder lower than 50 IRE units will result in the loss of video. An IRE unit is a measurement designated by the Institute of Radio Engineers, which has integrated with the Institute of Electrical and Electronic Engineers (IEEE). The measurement indicates the amount of output signal strength generated by a camera. Or, in the case of an IP encoder, it represents the input signal strength required by the A/D (analog to digital) converter circuitry and Ethernet interface in order to process the video image into a network. A proper camera design should produce video signal strength at the camera location of 100 IRE units. With correct cable selection and the recommended cable distances, the input to the Ethernet encoder will be 50 IRE units. This IRE level is common for most network encoders for proper operation. Less than that level will result in either no video image or a freeze-frame effect on the network. The reason for the mismatch is in the resistance or loss of the materials within the coaxial cable construction, as well as the frequency bandwidth of the cable parameters. The reason why aluminum (RF) cable is used comes down to cost. These parameters are based on a 100-IRE video input to the cable from the camera to produce 50 IRE at the end of the cable run, and all copper material for the center conductor and shielding of the cable. Aluminum shielding as well as a copper-covered steel center conductor creates a greater loss of signal strength and bandwidth, and failure within the system. What other areas should a technician consider that can cause loss of video signal strength? Alternatively, what additional questions will help in determining if the system problem is cable-related? Let’s return to the question: When was the cable installed? This question may appear to be unnecessary, especially if you installed and maintain the system. However, for those who were not involved with the original installation or are just entering a location for the first time, this question can save a lot of troubleshooting time and effort. If the answer is “The system was just installed,” consider the factors we will now discuss in detail. The odds are, even if the proper type of coaxial cable was installed, excessive force might have been used when it was pulled or someone may have exceeded the cable’s bend radius. These issues will result in no or distorted video signals. When pulling cable, tension must be applied to all elements of the cable in an even fashion without violating the cable’s maximum limits. This means carefully stretching the cable as evenly as possible along its entire length without exceeding recommended tension. As a result of a precision manufacturing process, coax possesses a number of electrical characteristics and a pull string should be used when running it through conduits, ducts or electrical metallic tubing (EMT). Impedance level, signal loss and return loss can easily result if you distort coaxial cable. Pulling it without the use of a pull string or rope increases the likelihood of stretching the cable and distorting those electrical qualities. This may not sound that significant, but once again we must always remember cable is the lifeline of the surveillance system. Exceeding the recommended bending radius will also distort the signal. Even if you do not actually kink the cable, any severe bends can distort its electrical characteristics. Fortunately, there is a good rule of thumb to follow: The recommended bend radius for coaxial cable installed in any surveillance system is 10 times the outside diameter of the cable. Now that we have a basic understanding of the coaxial cable requirements for a hybrid system, how can a field check be initiated to determine if the coax is within resistive tolerance or if the proper signal strength exists at the network encoder? The first step is to conduct a coaxial cable compliance check. It will only require a simple volt ohm meter (VOM) and BNC shorting stub. If the system has improper cable installed, excessive force was used in pulling the cable or the normal bend radius was violated, the consequent imperfections will be apparent in the coax’s total resistance level. Reference the diagram below to carry out the following test procedure: Short one end of the coaxial cable from the center conductor to the shield using a BNC shorting stub. Connect the other end of the cable under test to a VOM. Use a BNC to banana plug adaptor. Place the VOM in the ohms position. Measure the DC resistance of the cable. The tested DC resistance should not exceed 7 to 10 ohms. This DC resistance reading can indicate whether the cable type, bending and installed distances are within the proper ranges. The resistance level can be less than the required 7 to 10 ohms; however, if the reading is greater than that amount the result could be a loss of video in your system. These readings are compiled with a starting signal reference of 100 IRE at the camera location and the proper coaxial cable. Returning once again to the question of when the cable was installed, if the answer is that it was a long time ago the odds are you have corrosion or moisture problems with your cabling network. The above test procedure will also verify this, and the solution will be replacing the cabling. What about the other side of a hybrid system when an IP camera is installed with network-grade cabling such as Cat-5e/6; are pulling techniques just as important? The answer is yes, and in most cases the pulling procedures are even more critical than those involving coaxial cable. The reason is in the bandwidth requirements for both standard IP and megapixel cameras. Troubleshooting IP cameras is a bit more complicated than combining analog cameras with a network encoder. If you are not seeing any images in your network system, the first basic test is to ensure that the camera is actually producing video. On the analog-to-network-encoder section side of the surveillance it is quite easy to determine if you have a video signal. Just check the output of the cameras with a basic video test monitor and connect it to the BNC connector on the back of the camera. However, when incorporating an IP or megapixel camera, the output of the camera is a stream of data. Hopefully the installed network camera has a video monitoring output jack. Most high-quality networking cameras do have this important feature. Look for it; it will save a great deal of time and frustration. The output jack allows you to see if the camera has a video signal before it reaches the compression and Ethernet interfaces. If video is present, at least we have a starting point for troubleshooting this portion of the system. As before, ask the questions, which now instead of pertaining to coaxial involve networking cable. As to the type of cable, refer to the category of the networking cable. The most common will be either Cat-5e/6. Each has different bandwidth and design characteristics that are important when transporting massive amounts of data. The general differences between Cat-5e and Cat-6 are the transmission performance and extension of the available bandwidth from 100MHz for Cat-5e to 200MHz for Cat-6. These improvements provide a higher signal-to-noise ratio (SNR), allowing for higher reliability in video applications and higher data rates when megapixel devices are employed. Cat-6 cable comes with four twisted copper wire pairs, and each twisted pair is built of larger 23-gauge copper. The earlier model, Cat-5e, used 24-gauge copper wires. This reduction of wire size lowers the overall DC resistance loss, which can improve PoE (power over Ethernet) performance. The performance of the cabling network is heavily dependent on the installation. The components used in structured cabling installation have been carefully designed and tested to meet the requirements of EIA/TIA 568 for performance. If you suspect that the cable may be at fault, conduct a visible inspection of the cable runs. Look for items such as tie wraps being too tight around the cables. In fact, plastic tie wraps should not be installed on any network cabling. The use of Velcro is a more desirable form of support for any type of cable. Look for bends in the cable. The minimum bend radius for Cat-5, -5e and -6 cables is four times (4x) the cable diameter, which is approximately ¾ inch to 1 inch. When cabling is bent beyond this specified minimum bend radius, it can cause transmission failures. All pathways must maintain the minimum bend radius. Do not forget the possibility of excessive force having been exerted when the cable was first installed. Most Cat-5 manufacturers recommend a pulling tension of no more than 25 pounds. The conductors inside the cable are small and relatively fragile. Breaking one conductor will render the paired wire useless as well. This means one broken wire will put two out of commission. In order to check and verify the quality of the network cable, there are three basic tests that can be performed: wire mapping, length and bandwidth. We’ll take a look at each of them and the equipment needed to test these parameters. Open pairs — a wire not connected at either end will report as open. It’s usually caused by a missing or faulty crimp or broken wire. Shorts — caused by two wires in contact somewhere in the cable. Reverse pair — one or more wires are not connected to the correct pins at the other end of the cable. Split pair — pairs should be connected to meet T568A or B standards. Cable length — Since networking cables must not exceed 90 meters (290 feet) for the backbone plus 10 meters (38 feet) for interconnects, or a total 100 meters (328 feet) from device to device, according to networking standards, the length should be tested if you are having a problem with accessing video on the network. This can be accomplished with a time domain reflectometer (TDR). This tester sends out a pulse, waits for an echo from the far end and measures the time it took for the trip. Knowing the speed in the cable, it calculates the length. All cable certification testers include a TDR to measure cable length. Bandwidth — Insufficient system bandwidth can cause severe problems. Every system will have a minimum bandwidth requirement. As always, the weakest link will limit this bandwidth and in most cases the weakest link is the network cable. Cat-5e can be used for video networks up to 100MHz and limited 1,000Mbps transmission speeds. Cat-6 supports 10Gbps (1,000Mbps). In closing, there is one last area that is often overlooked in troubleshooting a system. Whether it is coaxial cable or networking cable, connectors play a very important role in the overall quality of the system performance. So inspect them very closely and always ensure the use of high quality-grade connectors.